Until all motors are designed with built-in bearing protection, plant maintenance personnel and motor repair shops will continue to replace damaged bearings. But if a motor's bearing problem is fixed correctly and proper mitigation installed, it only has to be done once. Better yet, informed technicians can make use of the latest diagnostic techniques (vibration analysis, thermography, shaft-voltage testing, etc.) to ward off electrical bearing damage from the beginning. For a new motor or one already in service, this is what is meant by "best practices." Variable frequency drives (VFDs) or inverters can save 30 percent or more in energy costs. Because of this, they have been cited as a key technology for those wishing to make their processing plants, automated assembly lines, HVAC systems and other equipment more energy-efficient ("green"). Unfortunately, whether used to control a motor's speed or torque, VFDs often induce voltages and currents that can damage bearings. In fact, the costly repair or replacement of failed motor bearings can wipe out any savings a VFD yields and severely diminish the reliability of an entire system. Bearing failure rates vary widely, but evidence suggests that a significant portion of these failures occur only three to 12 months after system startup. Because many of today's motors have sealed bearings to keep out dirt and other contaminants, electrical damage has become the most common cause of bearing failure in AC motors with VFDs. The high switching frequencies of today's VFDs produce parasitic capacitance between a motor's stator and rotor. 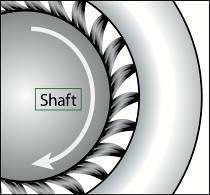 By now it is widely understood that once the resulting shaft voltages overcome the dielectric properties of bearing grease, they discharge along the path of least resistance — typically through the bearings (Figure 1). Figure 1. 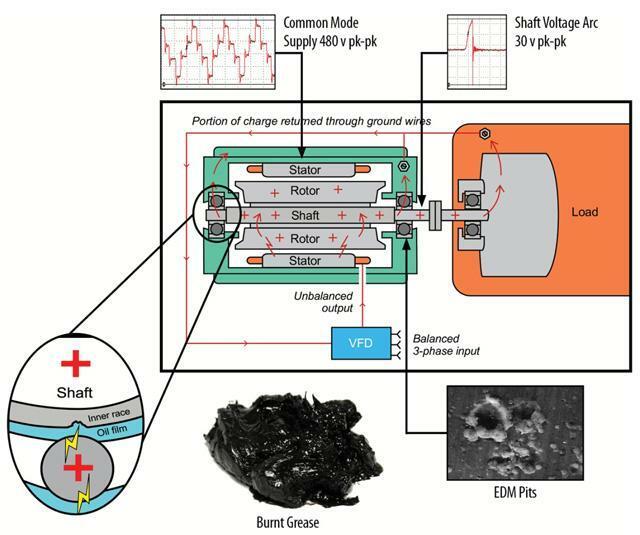 Voltages arcing through the bearings of VFD-driven motors create thousands of pits, which cause increased friction and noise and the potential for costly unplanned downtime as bearing grease deteriorates. These discharges are so frequent that they create millions of tiny fusion craters. Before long, the entire bearing race wall can become marked with countless pits known as frosting. A phenomenon known as fluting may occur as well, shaping the frosting into washboard-like ridges across the bearing race (Figure 2). This causes noise, vibration, increased friction and catastrophic bearing failure. and vibration and accelerate bearing failure. As the bearings degrade, the tiny metal particles blasted from the fusion craters intensify friction and abrasion, heat up the bearings, and burn the contaminated grease. Too often, the end result is bearing failure and costly unplanned downtime. Inspect the bearing cavity, retaining a sample of the grease in case further analysis is warranted to detect contaminants, signs of excessive heat, etc. Cut the outer race in half. Clean the bearing's components with a solvent. With a microscope, inspect the race walls for electrical pitting/frosting/fluting. If inspection of the old bearing indicates electrical damage, the most reliable and cost-effective way to protect replacement bearings is to install a modern shaft grounding ring. Unlike older single-point contact brushes, these rings completely surround a motor's shaft with contact points. Conductive microfibers should line the ring's entire inner circumference, boosting the electron transfer rate (Figure 3). A properly installed ring provides a very low impedance path from shaft to frame, safely bleeding off damaging voltages to ground and bypassing the motor's bearings entirely. Because the microfibers work with little or no contact, they do not clog up and wear out like conventional grounding brushes. To maximize a grounding ring's effectiveness, all electrical paths must be conductive. Paint on the motor's faceplate must be removed. Likewise, the motor's shaft must be cleaned down to bare metal. Even after scrubbing with an emery cloth, wiping the shaft with a non-petroleum-based solvent will remove unseen residues. After cleaning, the conductivity of the shaft should be checked with an ohm meter. 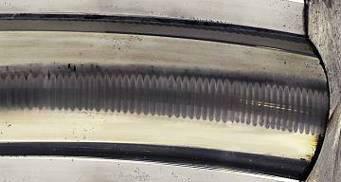 If the reading at the section that will contact the ring's microfibers is higher than 2ohms, the shaft should be cleaned again. A grounding ring should never operate over a shaft keyway, which has sharp edges and could reduce conductivity. On some motors, the dimensions of the spacer and mounting screws can sometimes be adjusted/changed to avoid a keyway. If this is not feasible, the portion of the keyway that will contact the ring's microfibers should be filled with epoxy putty. Conductivity should be further enhanced by lightly, but evenly coating with colloidal silver any portion of the shaft that will contact the ring's microfibers. This will also help retard corrosion (Figure 4). the ring with colloidal silver. Thread-locking gels and liquids other than conductive epoxy are not recommended for the screws that mount the ring to the motor, as they might compromise the conductive path to ground. When mounting the ring externally to an end bracket, split rings designed to slip around an in-service motor's shaft instead of over its end simplify installation. For environments where the motor will be exposed to excessive amounts of dirt, dust or other debris, it may be necessary to protect the ring's fibers with an O-ring or V-slinger. Bearing isolators with built-in circumferential grounding rings are also available. 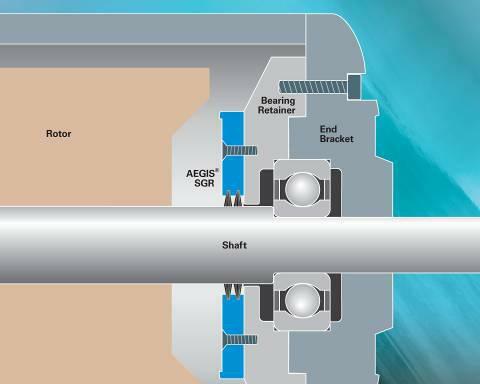 For severe-duty environments such as many mining applications, however, mounting the shaft grounding ring inside the motor provides the best protection from contamination (Figure 5). Using conductive epoxy or screws, the ring can be mounted directly to a bearing retainer. An additional machined spacer will keep the ring away from the bearing grease cavity. 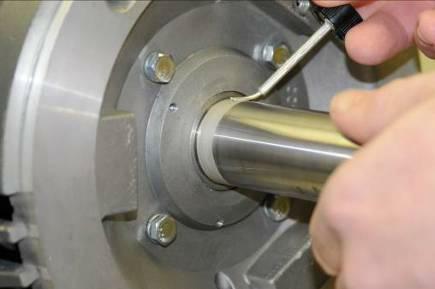 Metal-to-metal contact is still essential, so the bearing retainer must be free of any coatings or other nonconductive material where it will touch the ring. For horizontally or vertically mounted motors with horsepower of 100 or less and single-row radial ball bearings on both ends, a shaft grounding ring can be installed on either end. For horizontally mounted motors with horsepower greater than 100 and single-row radial ball bearings on both ends, the bearing housing at the nondrive end must be electrically isolated to disrupt circulating currents. Options for achieving such isolation include insulated sleeves, nonconductive coatings, ceramic bearings or hybrid bearings. The grounding ring should be installed at the drive end. For any motor in which the bearings at both ends are already insulated, the drive end is preferred for installation of a grounding ring to protect bearings in attached equipment such as a gearbox, pump, fan or encoder. Measuring shaft voltage on a VFD-driven motor provides valuable information for determining whether there is a risk of electrical bearing damage. The best time to take such measurements is during the startup of a new or recently repaired motor. Every motor has its own unique parameters. Combined with vibration analysis, thermography or other diagnostic services, results (including saved oscilloscope-screen images) can be presented in a report to the supervisor/customer. Results should then be used in developing preventive and predictive maintenance programs. Shaft voltages are easily measured (using appropriate safety procedures) by touching an oscilloscope probe to the shaft while the motor is running. The best probe will have a tip of high-density conductive microfibers to ensure continuous contact with the rotating shaft. A portable oscilloscope with a bandwidth of at least 100 megahertz should deliver accurate waveform measurements. Probe/oscilloscope kits are available. Just as shaft voltage measurements can show that a motor's bearings are in danger of electrical damage, they can also confirm that a shaft grounding ring is working. If a proven ring has been properly installed, typical discharge voltage peaks should be less than 10 volts. In summary, end users of VFD-driven motors have every right to expect uptime and reliability. After all, VFD-induced electrical bearing damage can now be prevented, not just repaired. Routine inspection, testing and analysis can provide advance warning and insight into the problem, and when bearings fail, proper repair practices can fix the problem for good. Motor shaft grounding rings can be installed during motor repairs or on new motors before they are put into service.